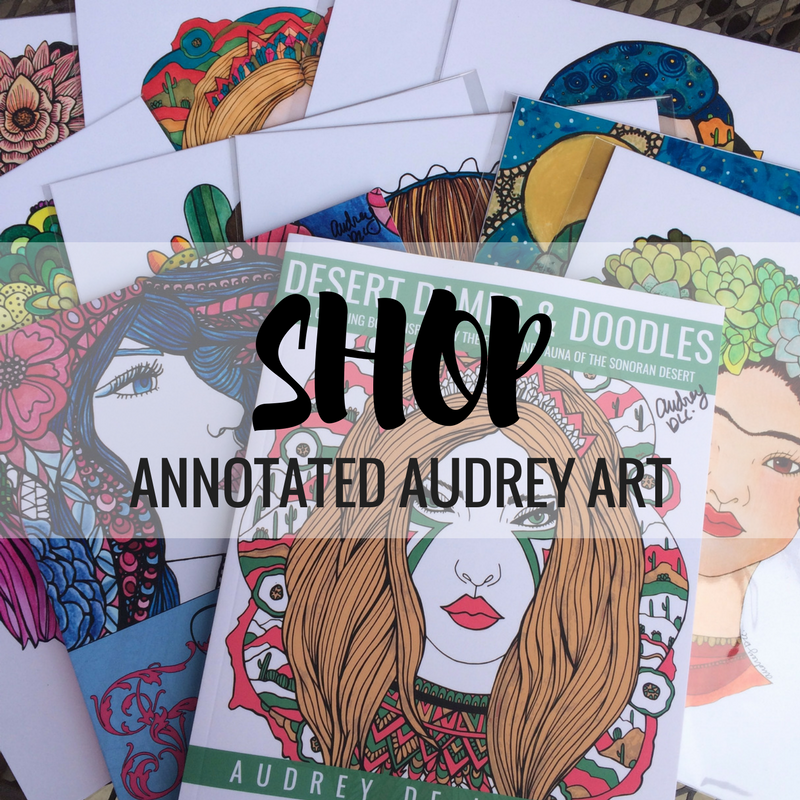 When I released my first coloring book collection, I got some questions about supplies and techniques for beginners. To answer some of the questions I received, I decided to create a short series called Coloring with Audrey. In this series, I will showcase some of my favorite coloring supplies and basic techniques. To illustrate the techniques I describe, I will share some of the images that I’ve colored from my coloring books. While there are many art supplies to choose from in the vast universe of adult coloring, the two coloring implements I am most familiar with (and always seem to gravitate towards) are colored pencils and markers. Colored pencils are great for building gradual layers and creating depth and dimension. Markers are great for laying down color quickly and for creating a more vibrant look. In this post, I will cover colored pencils and in the next, I will cover markers. Like with all art supplies, colored pencils range in quality and price. One important thing to note is that harder pencils are better for detail and softer pencils are better for blending. This is because the softer a pencil is, the more color will leave on the paper. Harder pencils will leave less color on your paper, which allows you to build up gradual layers or convey textures with your pencils. As you will soon witness, you don’t need to spend a lot of money to end up with some pretty awesome results. I colored this picture from my Feminine Florals Coloring and Inspiration Journal using colored pencils that I found at the dollar store. The pencils themselves are noticeably cheap, but if you use the right technique, you can end up with a great final product. Here are 4 tips on how to make the most of your inexpensive colored pencils! Be gentle.Since inexpensive pencils tend to be hard, the best way to use them is to color lightly. Layer. Layer. Layer. Use different colors to create tons of layers. This will make colors more vibrant. Take your time!- Don’t rush. Gradual layers will help create depth. The techniques listed above can be used with any colored pencils that are hard or somewhat scratchy. This is also the technique that I use with Rose Art (gasp) and Crayola colored pencils. As far as inexpensive colored pencils go, Crayola is (and always has been) my brand of choice. Here’s a link to a set of 50 Crayola Colored Pencils on Amazon. This is a great starter set if you are just looking to get started with coloring. Of course, as a colored pencil fanatic, my collection far exceeds the pencils found at the dollar store. Up next, I will cover two brands of artist grade colored pencils for those of you who want to take coloring projects to the next level. If you loved crayons as a kid, these are the colored pencils for you. These pencils are soft, smooth, and great for blending. In fact, out of the countless brands of colored pencils I’ve tried, these are definitely the creamiest and smoothest. Even though these pencils are great, they definitely have their flaws. One of my biggest problems with these pencils is that they are prone to wax bloom, which is a waxy build up that appears on your images if you overwork the surface. Additionally, the soft cores are very brittle and can break easily if you press too hard. Naturally, the pencil’s brittle nature also makes them hard to sharpen. If you choose to buy these pencils, save yourself a world of frustration and invest in an electric sharpener. They make sharpening much faster/easier. Here’s an Electric Sharpener designed for colored pencils. Typically, you can find these pencils at the art store for about $2-3 each. However, I’ve found that the best value actually comes from buying sets. Amazon is usually the most inexpensive place to buy these pencils. Here’s a good set to start with (48 piece set). Faber Castel Polychromos pencils are vibrant, oil based and blendable. While these pencils aren’t creamy like the Prismacolors, they are decidedly better at capturing detail and are much easier to sharpen. Also, since these pencils are oil based, rather than wax based, you don’t have to deal with wax build up (wax bloom) on your pictures. Just like the Prismacolor pencils, Polychromos pencils are about $2-3 per pencil if you buy them open stock at the art store. A great idea is to buy a small set to work with and then decide later on if you want to invest in more. Here is the set of 12 that I started with. If you are ready for a bigger investment, you can buy the entire set of 120 pencils which I currently own and absolutely love. It’s hard for me to decide which of these pencils is my favorite, because they all have different applications. Likewise, they all work great in concert with one another. Perhaps the most valuable advice I can give you is just to pick up the supplies that you can afford and just play around with them. Art is a process of discovery… have fun exploring. Thank you for this post. I’m pleased to see the Polychromos get a good review here. I don’t own Prismacolor yet but I may have them on my Christmas list. I look forward to more of your tips on colouring. I wish I had enough time to need a better set than my trusty old Crayolas! I like that – as it is just for fun, I’ll stick with the cheapies – save my money for more dog toys and costumes!